How many MPF schemes do you operate/are you a member of? As of December 2018, the number of MPF schemes has shrunk from 51 (by 20 providers) in 2000, on implementation to 32 (by 17 providers). Note: Big doesn’t mean better as big does not guarantee better service, though smaller schemes do pose the question of economies of scale which could impact fees and sustainability. So how many schemes do you belong to? With most people wanting more choice, the trend is for employers to provide more than one MPF scheme. Do you have more than one choice? How is your employer helping you choose the right one? What about personal accounts? How many do you have? If your answer is more than one, why? Sometimes “less is more” if you want a holistic view of your retirement investments. If you have not been consolidating your personal accounts when changing jobs, you should include a review of existing holdings on your 2019 to-do list. The e-Enquiry of Personal Account function on the Mandatory Provident Fund Schemes Authority (MPFA) website can help you track down your accounts. How have your funds been doing? Apple-to-apple comparison: returns for the Hong Kong Equity Fund is certainly expected to be higher that the Hong Kong Dollar Money Market Fund in the long run. Please bear in mind the nature of the fund you are reviewing and make sure that you are comparing like-with-like. Looking at your investment over a longer time horizon: say five years or more, to reduce the impact of short-term fluctuations and better reflect the ability of the investment manager over different market cycles (upturn, downturn, etc.). Although historical performances can provide an indication of the investment manager’s skill, past performance is no guarantee for the future, nor does it reflect any recent changes (e.g. in investment strategy). Volatility of the fund: funds of the same category have different exposures to investment risks because of the investment managers and their styles. Investment risk is typically measured by the volatility of returns in the industry and in the case of the MPFA, by the Fund Risk Indicator. The higher the volatility, the higher the inherent risks of the fund. From an investor’s point of view, the ideal is to have funds with high investment returns and low volatility. Fees charged are directly reflected in the unit price of your fund and will impact your retirement savings. 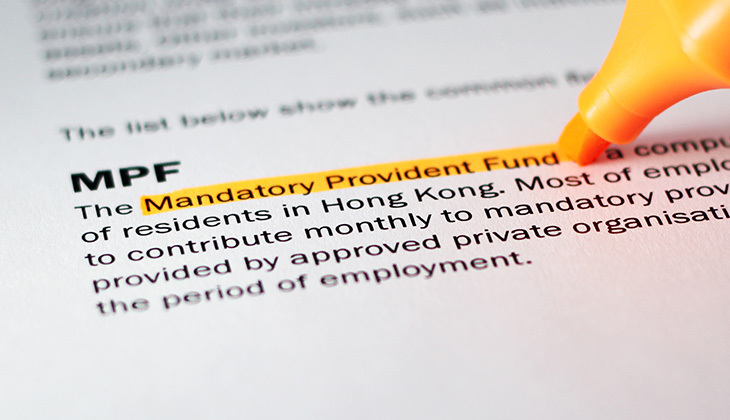 Two common measures for fees under the MPF system are the standard management fees and Fund Expense Ratio (FER). Standard management fee is the published fee on the brochure for trustee, custodian, administrator, investment manager and scheme sponsor, but normally does not include other sundry charge. Whereas the FER is the ratio of total fees and charges (including all fees and charges) to its fund size, but is measured based on data of the previous financial period (and so not current). Looking at both will give you a better understanding of the fees of the fund. Useful tool: The Fund Performance Platform on the MPFA website contains all the information mentioned above. Is more (fund choice) better? Possibly yes IF you are knowledgeable in investment matters but most of us are not. More fund choices can be confusing and lead to investing in funds not suited to your situation/investment appetite. We believe it is more important to look at the types of fund offered, and consider their risk profile. In general, equities are higher risk over the short term because their returns can change a lot, whereas bonds and cash are lower risk investments because returns are more stable over the short term. An extra caution on Guaranteed Funds—it is vital to understand the nature of the guarantee (e.g. capital guarantee, return guarantee, etc.) and the terms and conditions under which the guarantee applies before investing. How well is your MPF provider supporting you? How long does it take to complete a switch? The quicker the transaction is completed, the shorter your out-of-market period. How many free switches a year? Can a different allocation apply for different accounts (member and employer, mandatory and voluntary)? You might want different outcomes for different accounts. How well is your MPF provider communicating with you? Websites are standard, but what about interactive voice response system (IVRS), customer service hotlines and customer service centres? Are these available at a time convenient to you, e.g. after office hours? Do they have ATM services and mobile phone applications? Some providers now offer e-Enrolment where you no longer need to fill in hardcopy enrolment forms. Are they providing you with the right education materials, e.g. retirement saving calculator, risk assessment, market outlook articles or videos, regular seminars? Is their regular newsletter helpful? All of these can play a big role for you in the future. Useful tool: The Trustee Service Comparative Platform on the MPFA website provides a comparison for most members’ services contains all the information mentioned above. A holistic review helps you find the scheme that best suits you to achieve the best outcome from the MPF system. Aside from being diligent about your own MPF accounts, you, as an employee, should also regularly reflect your comments and opinions on your employer’s MPF scheme and request a review of the scheme if appropriate. There is still nine months in 2019, best get started soon!